Cala was born and raised in Damara, a harsh, wintry place hundreds of miles from the civilized lands in the west of Faerûn or the fortified halfling homeland of Luiren in the south. Cala's parents fell in with the evil forces of the Witch-King Zhengyi when it became apparent to them that he would conquer Damara. Still young and impressionable at the time, Cala saw how quickly her parents capitulated in the face of great evil and realized that evil was a road to power. Although she was not yet an adult when the Witch-King was destroyed, Cala chose the path of darkness and embraced the evil in her own heart. Feeling contempt for the weak humans of country, she learned the most effective ways to kill them. Cala works as a mercenary guide and a guard for caravans in rugged or cold places. Sometimes she sneaks away from camp to kill human members of her group with arrows, or plants false trails ahead to help lure her "friends" into dangerous situations. She may be encountered outside of Damara, Vaasa, and Impiltur in pursuit of a magic item (she would particularly like to get her feet into some boots of elvenkind) or an old vendetta, or even to escape someone who discovered her habit of killing her traveling companions. Cala trusts only herself, but she puts on a friendly face when dealing with strangers. Only with other halflings (and particularly lightfoot halflings, at that) is she truly friendly. 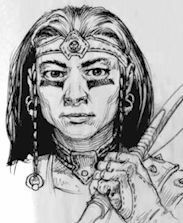 Cala Graycastle: Female Rgr2/Ftr3; CR 3; Small humanoid (lightfoot halfling); HD 2d10+4, 3d10+6; hp 37; Init +8; Spd 20 ft.; AC 18 (touch 15, flat-footed 14); Atk +10/+10 melee (1d4/19-20/x2, masterwork daggers) or +6 ranged (1d6/x3, masterwork shortbow); SQ favored enemy: humans, halfling traits; AL LE; SV Fort +9, Ref +6, Will +1; Str 11, Dex 18, Con 14, Int 12, Wis 8, Cha 10. Skills and Feats: Climb +5, Hide +13, Jump +1, Listen +1, Move Silently +9, Spot +4, Swim +3, Use Rope +9, Survival +4; Improved Initiative, Track, Twin Sword Style (when fighting with two daggers, may choose one opponent on her action and gain a +2 armor bonus to AC against that target; this bonus stacks with the armor bonus from armor and shield), Weapon Finesse (dagger), Weapon Focus (dagger). Favored Enemy: The ranger has selected human as a favored enemy. She gains a +1 bonus to her Bluff, Listen, Sense Motive, Spot, and Survival checks when using these skills against humans. She gets the same bonus to weapon damage rolls against creatures of this type. She also gets the damage bonus with ranged weapons if the target is within 30 feet. Halfling Traits: +2 morale bonus to saving throws against fear; +1 racial bonus to all saving throws, +1 racial attack bonus with a thrown weapon, +2 racial bonus to Climb, Jump, Listen, and Move Silently checks (already figured into the statistics given above). Possessions: necklace of fireballs (Type II), 3 sleep arrows, masterwork studded leather armor, 2 masterwork daggers, masterwork short bow, 17 arrows, 50 gp.